It has become vogue for Tai Chi / Qigong instructors to offer a range of warm-up exercises at the beginning of the lesson to prepare for the main body of the class. More robust martial arts activity require warm ups but they are largely superfluous and inefficient for gentle exercises such as exercise Tai Chi and Qigong. They reduce the time that the student could be working on their mindful forms. We need to be efficient. An exercise activity should provide comprehensive benefits on the physical, mental and metaphysical levels within its structure (without recourse to additional or external elements such as warm-ups). Few people have more than an hour a day at most to set aside for exercise activity. Efficiency means optimum benefits in the shortest time with minimum of effort. Unless you are an athlete it is superfluous to exercise for more than an hour a day. If you overdo it it could be counter-productive. So logically a perfect exercise should warm up and stretch the body as part of the main routine – as in the Chinese Wand Exercises (Jiangan) and Qigong exercises like Shibashi and Cheng Man Ching’s Tai Chi form. Traditional Tai Chi and Qigong routines are performed with correct alignment and with breathing coordinated with movement. This ensures mindfulness as we practice. However, some popular `warm-ups’ used in Tai Chi and Qigong classes are performed outside the mindfulness aspect – especially if they are based on circular movements. What’s wrong with circular movements? Nothing, if you make circular and spiral movement with your arms with help from your waist – as in Tai Chi and Qigong forms. The type of circular movements I am talking about are those that move limb joints in multi-directions. Circular movements in most warm-ups are mostly performed without coordinated breathing and also tend to use momentum to some degree. Momentum-based movement is movement without deliberate mindful effort coordinated with breathing. And if the point of your exercise is to `relax’ and `unwind’ then movements are working against this aim. detract from mindful aspect that we want to foster. I used to practice the Tai Chi Ruler but now I prefer the longer (four-foot) wand. Why? I spent most of my teenage years as a trainee cook. I was on my feet all day and evening chopping, rolling pastry and preparing dishes, while spending all my free hours playing my piano. I soon developed a painful condition in my upper back and neck – the result of holding both arms up in front of my body for long hours. Jump ahead twenty years when I was an office worker sitting at a computer for most of the day. I practiced Tai Chi in the evenings, which helped me cope with the effects of sitting at a desk for long periods. When I discovered the Tai Chi Ruler I was immediately impressed with its philosophy and simplicity. I began to practice it diligently in the evenings but my upper back problem returned! It wasn’t that I was doing the exercises wrong; it was the fact that I was spending most of the day with my arms up in front of my body at a computer and there was no release from this posture with the ruler exercises. I was a victim of overuse of repetitive movements (arms habitually held up close together in front of the body). Since then I have been careful to practice therapeutic exercises which contain contrasting and varied positions for the arms. When I discovered the Chinese Wand Exercises I found that the varied movements countered the effects of modern lifestyle. In recent years I have added some therapeutic gentle movements in the style of Tai Chi and Qigong routines. I believe that things have moved on from the time the Ruler was devised as a therapeutic exercise. Modern life’s problems are focused on tasks and behaviour that could not have been envisaged at the time. We live in a couch-potato, sedentary world where the daily use of modern technology puts our health – particularly our posture – at risk. And it is in this area that the ruler is not as useful as the longer stick. In `Ruler work’ practitioner place to their upper body in a similar `closed’ position as that forced on them by modern lifestyle. The images below show the remarkable similarity between typical Tai Chi Ruler posture and posture exhibited by people using smart-phones, tablets, laptops, game consoles, or sitting at desks and computers, etc. With the Ruler exercises, the focus is on the hands held a short distance from each other mainly in front of the body. It is impossible for the practitioner to open the arms because of the short length of the Ruler. These photos are typical of the most common Ruler postures, although there are some movements in which the arms are held up or turn to the sides the arms themselves never open up. Open Up and Receive the Power! By comparison, techniques of the four-foot wand (when held correctly in a wide grip) encourages opening the chest and shoulders – giving an unsurpassed range of movement and opening up the shoulder, neck and entire back. While hunched posture can raise cortisol – the `stress hormone’, opening up postures can raise testosterone – the dominance hormone. High-power alpha males in primate hierarchies who have high testosterone and low cortisol have lower stress. When a male takes over an alpha male role, within a few days that individual’s testosterone has gone up significantly and his cortisol has dropped significantly. So if we adopt wide postures we feel powerful, which decreases the amount of cortisol in our bodies and also the amount of stress. Therefore using the longer ruler in a wide grip can transform our health and well-being by improving our body language! Wand exercises which predominantly involve wide open postures make us feel more powerful and in control. Yet most people who practice the Tai Chi Ruler do so for its philosophical and spiritual concepts – as a way to meditate and focus / move internal energy – qi around the body. However, my book `Jiangan – The Chinese Health Wand’ revealed that the longer wand also has strong basis in esoteric philosophy and Traditional Chinese Medicine. Exercising with the implement stimulates qi circulation by gentle rhythms, and holding the wand and coordinating the movements of the hands and body with breathing helps to connect the energy flow and cultivate the Three Internal Treasures (essence, qi and spirit). We also train the connective tissue/bones, muscles and skin as we coordinate the hands, eyes, body and feet. All the movements are slow and gentle, with conservation of energy as an underlying principle of training. Both the short and long sticks have deeply philosophical and even spiritual elements such as focusing on `internal energy’, acupuncture points and meridians. The internal aspect of the longer wand emerges most within gently flowing exercises such as the rowing drills. I have created many based on simple footwork and circular / spiral movements. In the above exercises there is a wonderful sensation of exhilaration as the body opens up as it gently turns and stretches and moves the internal energy through the wand and throughout the body. There is nothing wrong with practicing traditional Ruler exercises; in particular, people who have an active life or a physical job will enjoy the focus of the narrower hand position. However, I prefer the four-foot wand because it is a more efficient implement for building comprehensive internal and external health and fitness – as well as improving psychological well-being. 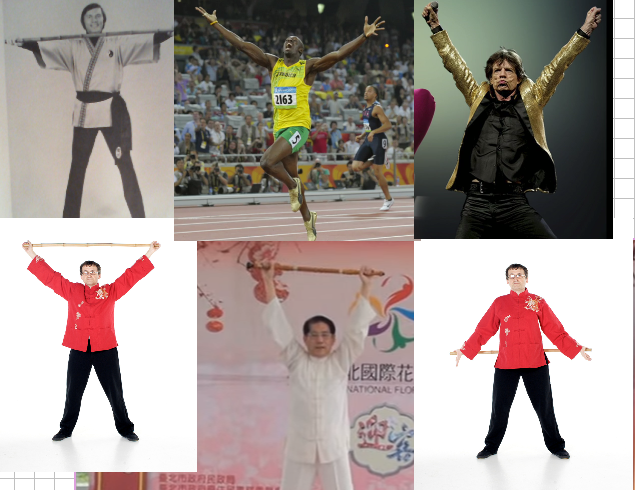 There are many kinds of stick `exercises forms’ from China and within Tai Chi / Qigong family. However, almost all of them are designed for martial effectiveness rather than for health and fitness. Martial forms require the stick to be held in a predominantly narrow grip so that it can be used either to ward-off an attack or attack an opponent. While this type of grip is functional for fighting it limits the possible range of beneficial therapeutic movements. Holding the stick with a wider grip offers a range of benefits such as opening the chest, improving lung capacity, improving range of movement, working the shoulder and entire back region. 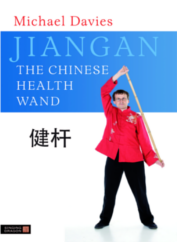 Shortly after writing my book Jiangan – the Chinese Health Wand, I created a moving form using a stick of the same dimensions. The `Tai Chi Boating Wand’ is a gentle moving form in which the body is constantly in motion, flowing from posture to posture with deliberate stepping (just like exercise Tai Chi). The Tai Chi Boating Wand involves `hand tasking’, wielding, coordination and focus skills similar to traditional Chinese weapons forms. It also stresses qigong; movements are coordinated with breathing and mindful attention. The form is essentially a set of graceful postures embodying the concept of Tai Chi. The wand is held in an expansive wide grip throughout most of the form, opening the chest (which, coordinated with deep diaphragmatic breathing, improves lung capacity). It also loosens the shoulders, stretches the arms and is a wonderful therapeutic exercise for the entire back. Most of the postures involve spiral and circular patterns that gently massage internal organs and twist the spine. The postures imitate traditional Chinese boating movements such as `rowing’, `punting’ and `turning rudders’. It is not a martial (fighting) form like traditional Tai Chi forms. It is a challenging and interesting non-martial `journey’ through a visionary landscape of rivers, lakes and gorges. With a bewildering array of health exercises from China – literally dozens of Tai Chi and Qigong forms, styles and routines – how do we choose one as our daily health routine? I have explained many times on this blog that for comprehensive health and fitness (“internal” and “external”) the 17 Chinese wand Exercises passed on by Bruce Johnson is a perfect daily routine for just about anyone. That does not mean to say that we would not benefit from other exercises routines once we have completed our daily round of wand exercises. For a long time I performed Tai Chi after the wand exercises, using the wand-led movements as a sort of warm up and stretching routine for Tai Chi. Then one day I felt that I wanted to continue holding the wand while performing Tai Chi and created the Tai Chi Boating Wand form. It is a flowing and very relaxing form that adds many benefits to gentle movement, such as improvement of posture and increased shoulder mobility. My daily exercise routine became the wand exercises followed by the Tai Chi Boating Wand. This is as simple and comprehensive as it gets. But….many students, while enjoying wand exercises, still want to learn Tai Chi and Qigong. During the late 1970s and early 1980s when I was learning Tai Chi there was basically only Cheng man-ching’s short form in the west. Nowadays the 24 Step Yang form has become and international standard. Both forms, while rewarding for dedicated long-term students, contain elements that are very challenging for the average person. I created the 55 Step “Flow Form” based on both forms but without the static single-leg stances and squats. So after the wand exercises students can either perform the Tai Chi Boating wand or The 55 Step Flow Form. Both options are as simple and comprehensive as it gets. Students ask about Qigong. It’s difficult to incorporate a Qigong routine into a class syllabus when there are hundreds of routines to choose from. For example the Chinese Health Qigong Association have created many new Qigong forms and still teach updated older forms. The interesting thing is that the stated health benefits of the routines are remarkably similar. Which Qigong form should I choose for class? I decided to use some of the “Shibashi” Qigong exercises because they are similar to the wand exercises in that they focus on both the external and internal and are practised with a moving flow which is neither too slow or too fast. The reality is that most students will not have the time or inclination to study the entire wand exercises, learn the 55 Step Flow Form, the Tai Chi Boating Wand or a the Shibashi Qigong routine. So I designed a sequence of 34 exercises which contain simple movements with comprehensive benefits from Tai Chi, Qigong and wand exercises. The routine, called the Tai Chi Wandwork 34, not only serves as a general introduction to these different forms but focuses on quickly getting circulation and energy moving in an accessible way. The form is simple yet just challenging enough to be enjoyable. The first 18 exercises are open-handed (no wand needed) and consist a selection of Shibashi and other Qigong movements and Tai Chi 55 Step Form. The last 16 exercises use a “wand” – a stick, wooden dowel or bamboo pole about 48 inches long and one inch thick to perform some Chinese Wand Exercises and movements from the flowing “Tai Chi Boating Wand” form. Breathing is integral to the movements of the whole program. Movements should not be too fast (using momentum) or too slow (with stagnant energy and no flow). A moderate, even speed is maintained throughout, coordinated with breathing. This methodology gently stretches the body and massages internal organs (with rocking movements, for example). While some students may want to go on and learn the various components of this form in their entirety, those seeking a 15 – 20 minute well-rounded gentle exercise routine for health and wellbeing need look no further than the Tai Chi Wandwork 34. It is a sort of one-stop shop for people with a wide range of medical conditions as well as the sedentary and office workers who sit for hours. Tai Chi Wandwork 34 is accessible for programs such as “wellness in the workplace” and the “GP Physical Activity Referral Scheme”. Doctors are now prescribing Tai Chi and Qigong for conditions such as: High Blood Pressure, High Cholesterol, Heart Disease, Muscle or Joint Problems, Anxiety or Depression, Arthritis, Asthma, Diabetes, Obesity, Sedentary Lifestyle, Posture Problems, Seniors Balance Problems, Slouching & Stooping. Tai Chi Wandwork 34 is especially beneficial for people suffering from ailments of modern life such as slouching and stooping caused by using smart phones / desktop computers / tablets and playing PC games. The movements excel at opening the chest, strengthening the shoulders, back and neck and combating bad posture. Some students of the Tai Chi Boating Wand form have asked how it differs from the “stick” form created recently by the Chinese Health Qigong Association. Firstly, while there are many “weapons” forms used as health exercises, both forms are non-martial with emphasis solely on health. However, they differ is some fundamental ways. At one extreme of Chinese health arts Tai Chi is marketed as an easy and painless exercise. At the other extreme is `Standing pole’. This is an exercise that involves standing in the same position for a long time without moving. You stand for longer and longer – until you can stand it no more – but then you must go further and the burn will come, legs start shaking causing the body pain and suffering. Proponents of the standing pole exercise say that most people give up this exercise because it hurts and that people who continue this exercise eventually become masters and achieve superior physical and mental capabilities. While this is not to be doubted, the trouble is that the practice of standing pole is difficult and hurts. Practitioners further claim that the fact that so few people are keen to do the exercise means that they are `special’, one of the few ‘worthy’. In a sense, they are. Only a minority of people want to do painful exercises each day of their lives. Standing pole is an interesting exercise – and it does actually `work’ in that you can eventually achieve benefit if you practice it for long enough. However, the benefits can be achieved through other practices that do not involve such hurtful self-torture. It is also an inefficient form of health and fitness training; it requires a lot of practice over a long period before any return and needs expert supervision and intervention. More importantly when standing still you sacrifice the benefits of range of movement. The standing pole method is suitable for fit martial artists keen to push themselves to the limit of endurance and you have to admire the dedication and single-mindedness of someone putting themselves through this year after year. But it is not a suitable technique for the average person, seniors, the obese and the sedentary. While I do not think that a gentle Tai Chi workout is enough to develop fitness we don’t need to torture ourselves with painful and stressful methods. The Chinese Wand Exercises are in the middle ground between gentle and more robust exercise, which is the reason I practice the art.